Typhoid is a serious illness, the fever of which is an infection that can cause high temperature and diarrhoea in adults. This disease can even lead to death, and therefore, you must be immunised against the disease, especially if you are travelling to countries where the risk of typhoid is high. A typhoid vaccination is one that can protect you from the disease and is available in two forms. One is a live, attenuated vaccine that is taken orally, and the other is an inactivated vaccine that is given as a shot. 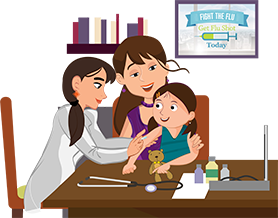 At Apollo Clinic, we understand the importance of vaccines for both, children and adults; and are therefore committed to supporting you and making sure that you are given the best medical treatment possible. Typhoid fever is an acute illness that is associated with fever caused by the bacteria called Salmonella Typhi. It can also be caused by the Salmonella Paratyphi, a bacterium that often causes a less severe illness. The bacteria of typhoid are usually deposited in food or water by a human carrier and are then spread to other people around the area. However, this disease is quite common in underdeveloped areas or areas with poor sanitization; and therefore, a typhoid vaccine is advised to those who often travel to such places. What is a Typhoid Vaccine and How Does It Help? A typhoid vaccination helps prevent the onset of the illness. There are two vaccines available internationally. While one is a live, attenuated vaccine that is taken orally, the other is an inactivated vaccine that is given as a shot. Both vaccines stimulate the body, to create antibodies that fight against the typhoid bacteria or germs. These antibodies will protect you from the illness, in case you get infected with the bacteria. However, it is vital to know that not everyone who takes the vaccine is completely protected against the illness. Who Should Get the Typhoid Vaccine and When? Most adults who often travel, especially to areas where sanitation and hygiene are poor must be immunised against the illness, as typhoid fever in these areas is a matter of concern. Few of the most affected places in the world are Asia, Africa, South and Central America. Therefore, if you live there or are visiting these countries, you must consider taking the typhoid vaccination. A typhoid vaccination prevents the onset of typhoid. A few side effects caused by the vaccine include a mild fever, headache, nausea, diarrhoea, abdominal pain, and temporary soreness and swelling at the injection site. At Apollo Clinic, we understand the importance of your health and therefore, provide immunisation services, one of which includes the typhoid vaccination for adults that will prevent you from typhoid. Offering immunisations for both, children and adults, we aim to ensure that you are safe from diseases and live a healthy life.